Library patrons are people to whom you can check out resources. On their own, they are able to search for resources, place holds, and leave reviews and recommendations. Staff, faculty, and students automatically have patron privileges in your library. If you wish to extend patron privileges to someone in your system who is not staff, faculty, or a student (such as an alum), you can give her the Library Patron role. If someone is not already in your system, you can also create a new patron. Click Add a new patron; the form works just like adding a new person (except for user roles and tags). Any online visitor can browse your library catalog by going to https://___.populiweb.com/library. The Patrons report includes all staff, faculty, students, and patrons in your library. Search for individual patrons by typing a name in the search field. 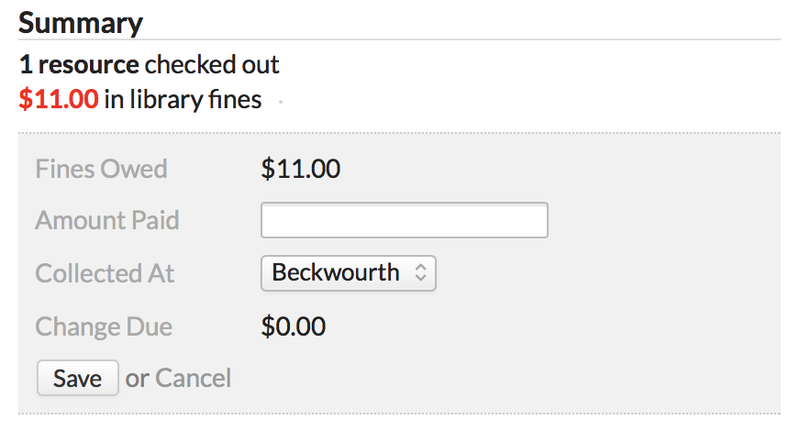 Use the drop-down to show patrons with resources, overdue resources, or unpaid fines. Use the links to email, text, or export a spreadsheet of the patrons returned by your filter. Every patron has a profile that shows their library-related activity. You can export a PDF of the patron's library card. View the patron's reviews and recommendations under the Reviews tab. Loans shows you anything the patron has ever checked out—use the filter to see what's on loan, what's been returned, and what has unpaid fines. Holds only lists current holds. If need be, you can click the link to cancel the hold. If a patron has fines, you can waive them, record the payment, or use some combination of the two. To waive a fine, click the Waive... link next to the overdue/lost resource under Loans. To collect a fine, click Record a payment under Summary. Enter the amount the patron is paying. If the patron has $4.25 in fines and pays with a $10 bill, enter 10 to calculate the change due. Where are you collecting this money? Select from your Libraries.